Not to be confused with cell phone cases, cell phone skins can be described as decals or stickers that people can add to their cell phones to give them a unique and personal look. Skins are usually made out of a vinyl material that is easily adhered to the surface of the cell phone. They are usually not permanent, so they can be peeled off and replaced. Cell phone skins are available for purchase from a number of retailers. Some online stores even offer the ability to upload your own custom artwork for further personalization. The SkinIt online store organizes its offerings by the brand name of the cell phone, covering a broad range of devices. These include Apple, HTC, LG, Motorola, BlackBerry, Nokia, Samsung and Pantech. Under each brand is a listing of the specific models for which cell phone skins are available. Once on the page for the particular cell phone model, the listing of skins can be sorted by category and sub-category. Skins featuring designs from various professional and college sports teams are available, like the NFL's Pittsburgh Steelers, the NBA's Boston Celtics, and MLB's Los Angeles Dodgers. Indeed, there are usually multiple designs for each team. Most cell phone skins from SkinIt retail for about $15.00, including secure fast shipping and a 30-day, hassle-free return policy. Custom designs are typically $19.99 and can be personalized through the in-browser wizard. Formerly known as Gelaskins, Nuvango provides some very unique designs for its catalog of cell phone skins. Most major brands of mobile phones are supported by Nuvango, including Apple iPhone, Blackberry, Google, Sony, HTC and Nokia. By clicking on the downward facing arrow next to each brand, you can select your specific device from the list. The gallery of available skins for that device are then displayed. This includes both the front and rear skins. The results can be further organized based on the "Collections" offered by Nuvango. Nuvango's designs are more artistic or expressive in their approach, rather than focusing on sports teams and other well-known iconography. Options include Abstract Art, Patterns & Textures, Urban Art and The Ocean Called. 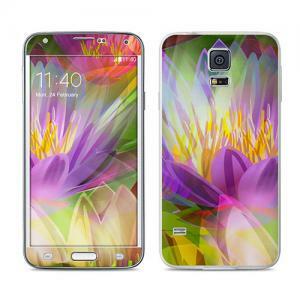 In addition to the range of designs offered by the professional artists, Nuvango also provides customers with the option of uploading and creating their own custom cell phone skins. This can be accessed by clicking on "Custom" near the top of the website and scrolling down to the section for Phone, Laptop & Tablet Skins. The web-based wizard walks you through the process of creating your custom skin. This involves choosing your device, uploading your image and setting the focal point. Nuvango's skins typically sell for $15 for both the front and the back. 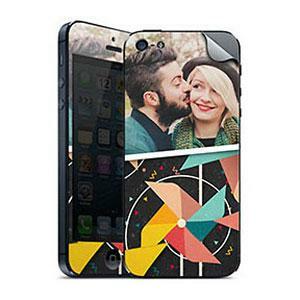 DecalGirl sells both custom and ready-made cell phone skins in a variety of styles. Product support is very good with such brands as Apple, Blackberry, Google, Huawei, LG, Motorola, Nokia and Palm. After choosing the brand and the specific model of phone, a gallery is presented with the available cell phone skin designs for that device. The results can be filtered based on the artist, brand, and artwork type. They can also be sorted by best sellers, most liked, trending or newest. DecalGirl also allows you to upload custom artwork to create your own unique skin. As with Nuvango, there is a browser-based utility for uploading images and then rotating, resizing and placing them on the phone. You can also add text or change the background color. When finished, you will be shown a preview before proceeding to the checkout. Most custom skins are $15. Most of DecalGirl's packages include both the front and back skin, as well as a matching wallpaper, for between $10 and $15. DesignSkins offers DesignFoils cell phone skin in two main types. The regular DesignSkins are "ultra thin, for every device" and are similar to the products offered by the other websites listed above. The 3D HaptikSkins, on the other hand, are skins that come with a "classy texture" for a unique feeling. Both are available for a range of devices. After selecting the type of skin, you can then search for your specific mobile phone. Supported models include the iPhone 6, Galaxy S5, and the HTC One M8. In addition to the designs available through DesignSkins, the website also provides a utility to create your own by uploading your own photos and images. The browser utility allows for the addition of shapes and text, as well as adjustments for transparency, height, width and rotation. DesignSkins start at $7.95, while 3D HaptikSkins start at $19.95. For people who are really concerned with how their cell phones look, adding a personalized and unique cell phone skin is the perfect solution to sprucing up the look of a phone. Since the skin itself is no thicker than a standard screen protector, it doesn't add any bulk to the device. Cell phone skin companies make skins that fit other sorts of electronic equipment too, so it is also possible to customize tablets, notebooks and portable game consoles.